Our aim was to assess the feasibility of the sequential application of extracellular matrix (ECM) and low oxygen to enhance chondrogenesis in human fetal synovium-derived stem cells (hfSDSCs). 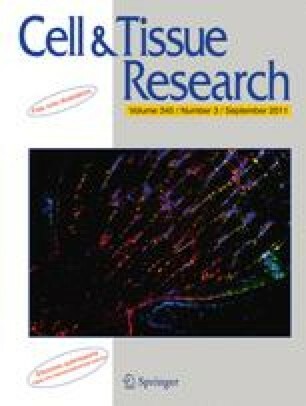 Human fetal synovial fibroblasts (hfSFs) were characterized and found to include hfSDSCs, as evidenced by their multi-differentiation capacity and the surface phenotype markers typical of mesenchymal stem cells. Passage-7 hfSFs were plated on either conventional plastic flasks (P) or ECM deposited by hfSFs (E) for one passage. Passage-8 hfSFs were then reseeded for an additional passage on either P or E. The pellets from expanded hfSFs were incubated in a serum-free chondrogenic medium supplemented with 10 ng/ml transforming growth factor-β3 under either normoxia (21% O2; 21) or hypoxia (5% O2; 5) for 14 days. Pellets were collected for evaluation of the treatments (EE21, EE5, EP21, EP5, PE21, PE5, PP21, and PP5) on expanded hfSF chondrogenesis by using histology, immunostaining, biochemistry, and real-time polymerase chain reaction. Our data suggest that, compared with seeding on conventional plastic flasks, hfSFs expanded on ECM exhibit a lower expression of senescence-associated β-galactosidase and an enhanced level of stage-specific embryonic antigen-4. ECM-expanded hfSFs also show increased cell numbers and an enhanced chondrogenic potential. Low oxygen (5% O2) during pellet culture enhances hfSF chondrogenesis. Thus, we demonstrate, for the first time, the presence of stem cells in hfSFs, and that modulation of the in vitro microenvironment can enhance hfSDSC chondrogenesis. hfSDSCs might represent a promising cell source for cartilage tissue engineering and regeneration. Imaging experiments were performed in the West Virginia University Microscope Imaging Facility, which is supported in part by the Mary Babb Randolph Cancer Center and NIH grant P20 RR016440. This study was supported by a faculty start-up fund from West Virginia University. The authors declare no conflict of interest in relation to this paper. None of the authors have any disclosures. We thank Suzanne Smith for editing the manuscript and Dr. Kathleen Brundage for her help in performing flow cytometry and data analysis. Imaging experiments were performed in the West Virginia University Microscope Imaging Facility.